11 Marlborough is located on the north side of Marlborough, between Arlington and Berkeley, with 9 Marlborough to the east and 13 Marlborough to the west. 11 Marlborough was designed by architect Charles K. Kirby and built in 1863, one of four contiguous houses (9-11-13-15 Marlborough). The four houses form two pairs of mirror opposite buildings (9-11 Marlborough and 13-15 Marlborough); each pair with a single entrance porch creating a symmetrical entryway. 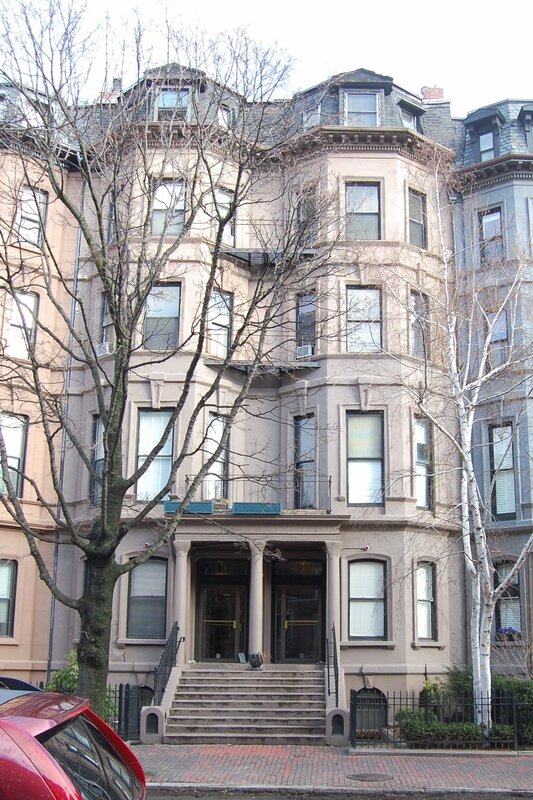 Click here for an index to the deeds for 11 Marlborough. On March 1, 1864, 11 Marlborough was purchased from Charles Kirby by Mary Louisa (Stanwood) Dorr, the wife of cotton broker Ellerton Lodge Dorr. They lived at the Coolidge House hotel. The deed included a provision preventing material changes to the front façades of either 9 Marlborough or 11 Marlborough without the consent of the owners of both properties. On April 8, 1864, 11 Marlborough was purchased from Mary Louisa Dorr by George Washington Warren. He and his wife, Harriet Atwood (Willis) Warren, made it their home. George W. Warren had been a dry goods merchant until 1857, when his business failed. He subsequently became a banker and note broker, and then superintendent of agencies for the New York Life Insurance Company. They continued to live at 11 Marlborough until about 1867, when they moved to the Hotel Pelham (southwest corner of Tremont and Boylston). On December 12, 1866, 11 Marlborough was purchased from George Warren by banker Charles Kane Cobb. He and his wife, Elizabeth (Codman) Cobb, made it their home. They previously had lived at 11 Brookline. Charles Cobb died in January of 1876. Elizabeth Cobb and their three surviving children – Charles Kane Cobb, Jr., Frederic Codman Cobb, and Elizabeth Codman Cobb – moved to 94 Pinckney. The Cobb family continued to own 11 Marlborough and lease it to others. In 1876, 11 Marlborough was the home of attorney Edward Albert Kelly and his wife, Mary Adams (Farley) Kelly. The previously had lived at 55 Chestnut. George F. Farley, Mary Kelly’s brother, lived with them. He was a tea importer and had lived with them at 55 Chestnut. The Kellys continued to live at 11 Marlborough in 1878. In January of 1879, they purchased and subsequently moved to 9 Marlborough next door. By the 1879-1880 winter season, 11 Marlborough was the home of Henry Penniman Bliss, a dealer in upholstery goods. He was a widower, having married first to Hannah Lorinda Warren, who died in January of 1849, and then to her sister, Adelia (Delia) Maria Warren, who died in February of 1878. At the time of his second wife’s death, they had lived in Cambridgeport. 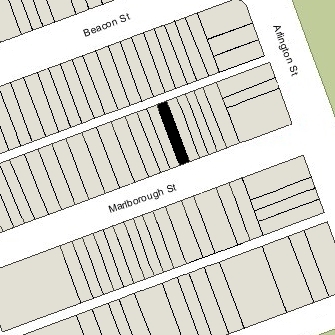 Henry Bliss continued to live at 11 Marlborough in 1894, but had moved to 260 Clarendon by 1895. By the 1894-1895 winter season, 11 Marlborough had once again become the home of Elizabeth (Codman) Cobb and her son, Dr. Frederic Codman Cobb, a physician and professor of Laryngology at Harvard. He also maintained his medical office at 11 Marlborough. By 1900, Elizabeth Cobb’s grandchildren, Charles Gilman Bowen and Sybil Kent Bowen, lived with them (their mother, Elizabeth Codman (Cobb) Bowen, had died in December of 1893; their father, Samuel Gilman Bowen, had remarried and was living in Tiverton, Rhode Island). They continued to live with them in 1910. Frederic Cobb married in May of 1913 to Evelyn Wyman Nagle. After their marriage, they lived in an apartment at 520 Beacon. He continued to maintain his medical office at 11 Marlborough, where his mother lived with Charles and Sybil Bowen. Elizabeth Cobb died in January of 1917. In February of 1917, Frederic Cobb applied for (and subsequently received) permission to remodel 11 Marlborough, and on March 31, 1917, he acquired the interests of his brother, Charles K. Cobb, and his niece and nephew, Charles and Sybil Bowen (who moved elsewhere). Frederic and Evelyn Cobb had moved to 11 Marlborough by the 1917-1918 season. He continued to maintain his office there and rented office space to other physicians. On May 22, 1922, Frederic Cobb transferred 11 Marlborough into his wife’s name. The Cobbs continued to live there in 1923, but had moved by 1924. At the time of the 1930 US Census, they were living in Manatee, Florida. On September 28, 1923, 11 Marlborough was acquired from Evelyn Cobb by Mrs. Eleanor D. (Clayton) Kennie Titcomb, the widow of Ora Titcomb. She lived at 81 Pinckney. On September 5, 1924, 11 Marlborough was acquired from Eleanor Titcomb by Nellie A. (Hungerford) Randall, the wife of Abel Palmer Randall. They lived in Hadlyme, Connecticut and appear to have acquired 11 Marlborough as an investment. In October of 1924, she applied for (and subsequently received) permission to remodel the interior, indicating that both the current and proposed occupancy would be a two-family dwelling and doctors’ offices. The longest-term residents at 11 Marlborough were Dr. Benjamin Collins Woodbury and his wife, Gertrude Frances (O’Neil) Woodbury, who lived there from about 1925. They previously had lived at 178 Commonwealth. He was a homeopathic physician, poet, and playwright. They lived (and he maintained his medical offices) at 11 Marlborough until his death in January of 1948. The other units at 11 Marlborough were occupied by shorter-term residents (with the number of units increasing by the mid-1930s). 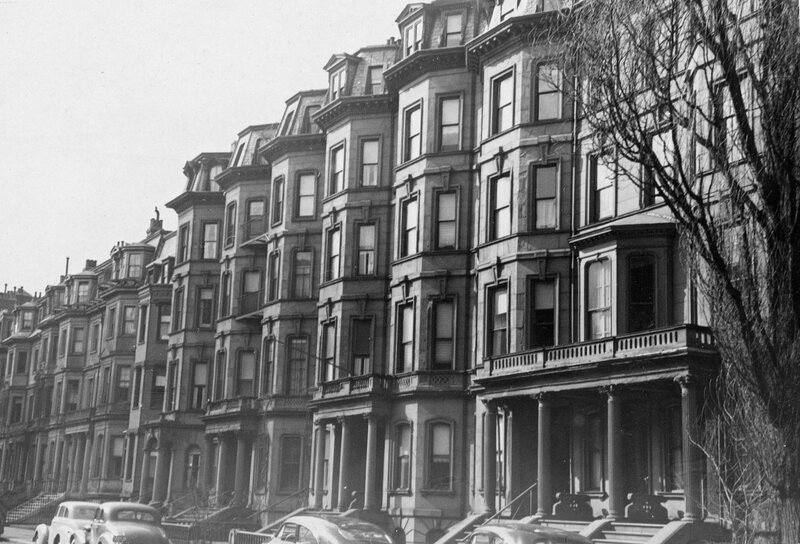 On December 30, 1938, the Boston Safe Deposit and Trust Company foreclosed on its mortgage to Nellie Randall and took possession of 11 Marlborough. The property changed hands and on March 20, 1939, was acquired by Miss Mildred Catherine Thelen of Lynn. On December 14, 1939, the house was damaged by a fire on the first and second floors. At the time of the fire repairs, in 1940, Mildred Thelen indicated that the occupancy was doctors’ offices on the first floor (presumably Dr. Woodbury’s office), and three dwelling units (one each on the second, third, and fourth-fifth floors). On September 23, 1963, real estate broker and investor Charles Talanian and his wife, Nevart (Semonian) Talanian, acquired 11 Marlborough from Mildred Thelan. They acquired 9 Marlborough at the same time. 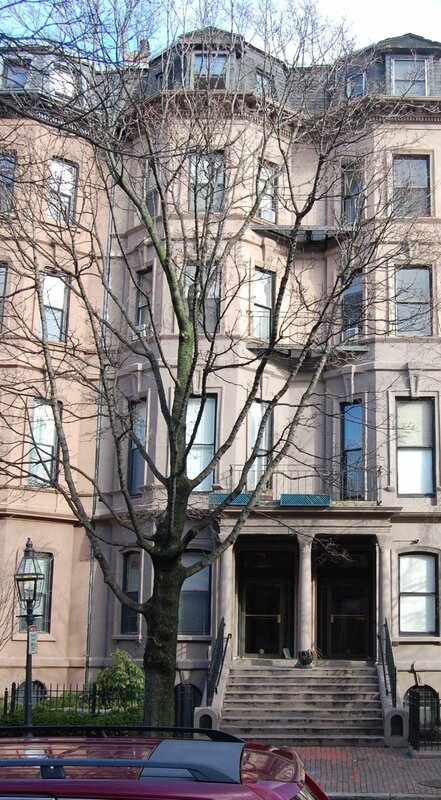 In January of 1964, Charles Talanian filed for (and subsequently received) permission to convert each house into eleven apartments (at the time of the application, the legal occupancy of 11 Marlborough was still as doctors’ offices and three apartments). On December 31, 1979, Charles and Nevart Talanian transferred both properties to Chatal Associates, LLC. Both buildings remained apartment houses in 2015.